Van Truck HFJ5027XXYAV manufacturers,Van Truck HFJ5027XXYAV exporters,Van Truck HFJ5027XXYAV suppliers,Van Truck HFJ5027XXYAV OEM service. Shandong HEIBAO Group Co., Ltd.
Van truck is a kind of cargo truck. 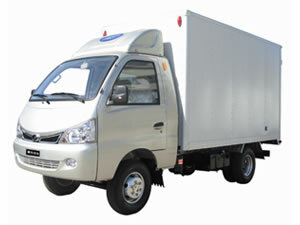 It is specially designed with closed truck body and separated driving cab. It is mainly used for sealing transportation of different goods. Some special types of van trucks are designed to transport frozen goods, warming goods, explosive and combustible goods and dangerous chemical articles. Van trucks are very safe and convenient. They are used in factories, supermarkets and individuals. Our van trucks are powered by diesel engines such as 4 cylinder engines, Euro 2 engine and other common diesel engines. These van trucks feature super load capacity, stable driving property and high working efficiency. They are safe and reliable to use. Van trucks are exported to more than 20 countries and regions such as Vietnam, Burma, Syria and Central America. They gain a great popularity in foreign countries. Copyright © Shandong HEIBAO Group Co., Ltd. All rights reserved.